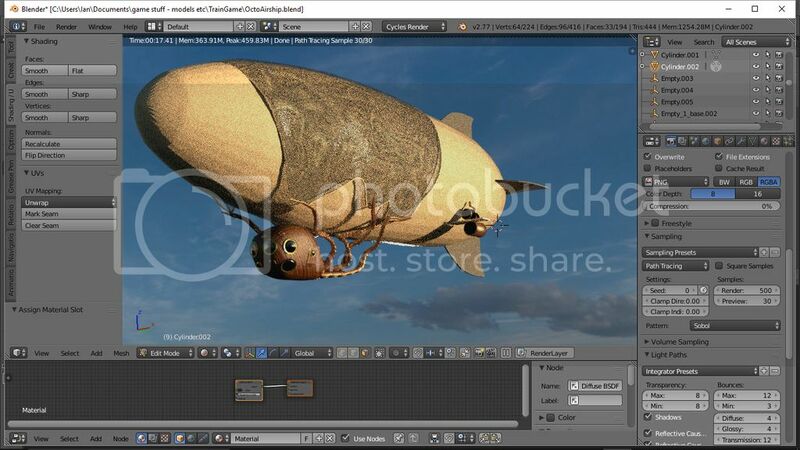 I'm working on a CGI model of a dirigible, and was wondering if anyone would care to critique it please? This time it's going to probably be a standalone piece of art (well, a picture anyway! ), and I'm reasonably happy with the main design. I really like the octopus arms holding the gondola, but I'm unsure of the net that secures the whole thing to the envelope. I've also yet to add the propulsion - I'm thinking small outrigger steam engines, but we'll see. Obviously this is a rough draft, so small details and rigging need adding too. So, without further ado - my octoship! I was also debating adding sails, maybe three jib style ones overlapping along the side, but again I'm unsure. I really like that control car. It makes me wish I could get close and stare through the portholes. I imagine it must be full of brass, glass, fine woodwork and leather inside. 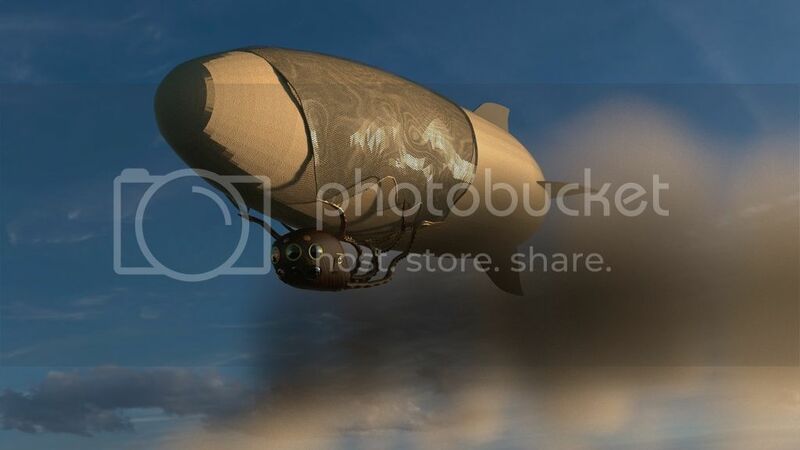 It's a fairly conventional dirigible shape, which, to my mind, makes it credible. I wonder about landing it? But perhaps the plan simply would be to attach it to a mooring mast, so legs may not be necessary. I'd like to see how you do end up powering it. Also, I'd imagine that it's quite a small airship. Or, does it have some accommodation within the hull also? In which case, you might want more windows or portholes. Regarding landing, I was planning on adding short steps from the door in the gondola; as you say, mooring posts would allow me to keep the lines clean on it. I'm glad you like the gondola - can you believe I Googled "octopus gondola" and got precisely zero relevant hits. I agree that the gondola is fantastic, but the gasbag is too conventional. Changing the tail fins would help. Perhaps make it look like a fish so that the octopus is attacking the fish. Perhaps make it look like a fish so that the octopus is attacking the fish. Extending that, possibly a whale, playing off the "giant squid battles sperm whale" thing. I'll have a play. 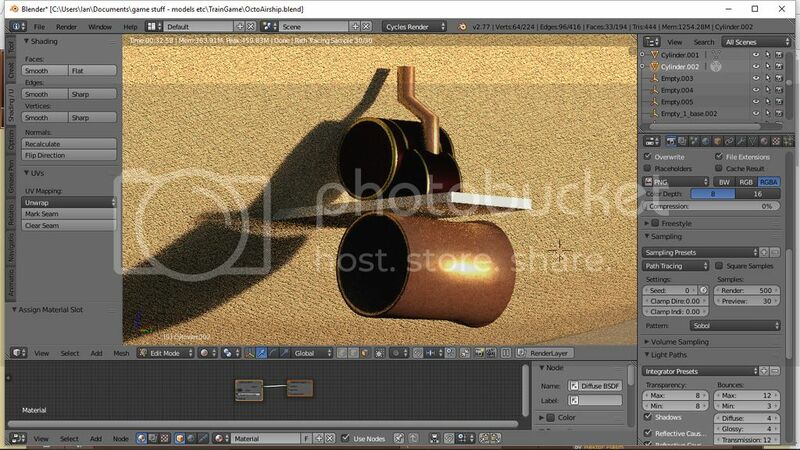 In other news, I'm currently modelling the propulsion system. I'm looking at outriggers below and forward of the fins, with a water tank and boiler on top, and a turbine below. I'm thinking high pressure steam drives a turbine, which uses the exhaust and the bypass method to drag air through and out the back. Still early on, and I've yet to model the turbine blades and pipes to link the boiler to the turbine, but as a concept, what do you think? The bits and bobs the better. That is up until the point where there is too much. Finding that point is the fun part. Increase the size and length of the tentacles and wrap them a little farther up the balloon. Make them a bit more obvious. It's a lovely idea! Can't wait to see how it develops. I would suggest taking a look at airships of a similar scale to the one you're working towards, currently something seems rather off balance or out of scale, though changing the shape of the envelope as suggested above may also help. I'd also suggest working with some references for the octopus part as well, currently it makes me think more of a jumping spider rather than an octopus. There's also no real feeling of weight to the connection with the envelope. Steam power has a few complications as an airborne power source, ignoring the petty ones still leaves you with care and feeding. Stuck way back there and up on the envelope might make stoking the boilers difficult. Perhaps closer to the main crew area would work, you could even play on the octopus's funnel if it's sited right. Could the tentacles be used instead of the net? Whether an attack or a symbiotic relationship I like the idea of two creatures. A splendid concept. I like the idea of shaping the bag into a whale. There's an illustration, I think in Vernes original 20,000 leagues, of an octopus wrapped around a sperm whale. If you want more space for passengers or crew how about an observation deck with railings and telescopes on the whales back? Rather like those platforms placed on an elephants back to hunt tiger from back in the days of empire. 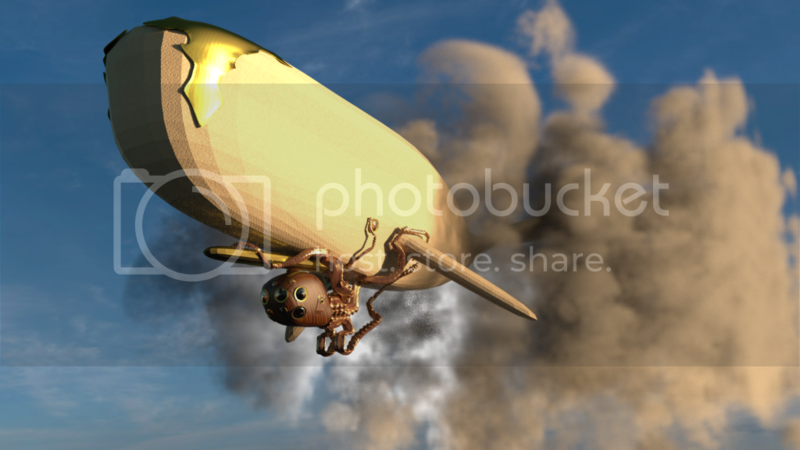 Also, remember this is an airship. It's meant to fly so like in a real aircraft weights and balance are important. If you place the cabin too far forward the it would ride nose heavy. Observers of your work may not know why but they will pick up that somethings not quite right. I'm looking forward to seeing how this pans out. 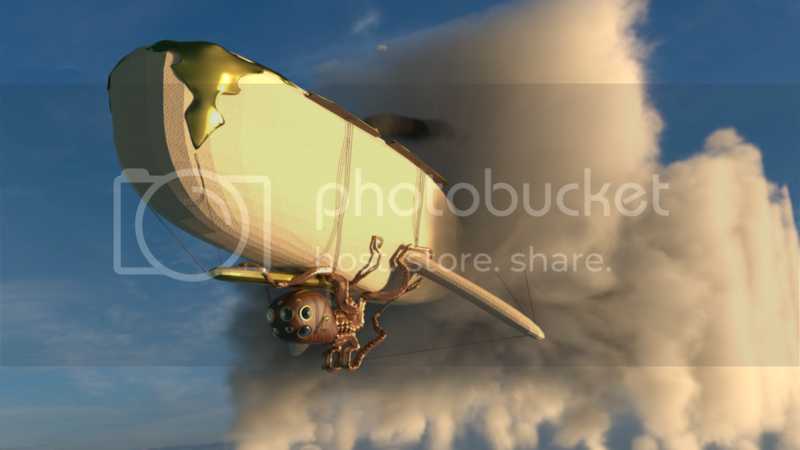 The Airship Looks Superb, You may want to Stretch the Gas Bag and Make it look a Little Better that way. Thanks for your feedback everyone, it means a lot . I've been exploring the whale idea - your thoughts please? I'm ambivalent as yet; sometimes I look at it with satisfaction, thinking it's heading well in the right direction, and other times I'm really not sure. Do you think the gas bag needs to be bigger still? Pilot's idea of an observation deck is a capital one - if the response to the change in design is positive I might look at that next. Obviously it's still propulsionless and riggingless... Inflatable Friend raised the (glaringly obvious now I look at it) point of needing to feed the boilers, so that needs addressing. I'm toying with the idea of running a smoke stack through the center of the envelope. After all, I've now added the "eye" window, suggesting internal space. A blow hole smoke stack? The horizontal flukes of a whale would present difficulties in steering an airship. Perhaps a V-tail, as on the Beechcraft Bonanza, would present an acceptable compromise? Would the fluke design still be a problem if it had elevators? I like where this design is heading. You need some form of rudder, and I can't see an airship being fast enough for drag rudders to be effective. Whales steer by twisting their tails sideways, which would be heavy and complex to do on an airship. I'm fairly certain, though, that I've seen whales hold their flukes in either a normal or an inverted V.
I'm sorry, but I do very much prefer the original design to the 'whale'. To my mind, the original looks very credible and in comparison, the whale looks less naturally airworthy. I'm glad you reduced the reflectivity of the darker area on the revised version of the original too. I thought that an improvement, and I liked the balance of the positioned engines. If you get the chance to go into the detail, I'd enjoy seeing external ladders. Cutty Sark was still working as a wind-powered cargo ship when the Zeppelins were bombing London, so airship designers thought there was nothing unusual in expecting the crew of an airship to climb the rigging to work their vessel. Hi everyone - thanks for your continued input. I've been caught up for a day or two doing clouds and the smoke stack - it's harder than you imagine, and it's left me precious little time for other design aspects. I've canted the tail into a V shape as suggested - although shrouded in clouds it's hard to tell. Possibly this is for the best! There's platforms of a kind on top, although I'm yet to see what people think of them, I think they're missing something. I very much like the external ladders idea (thanks Newchurch!) - I didn't realise there was such rigging in real life being clambered about on - that must've been incredible to do! I've added a couple of basic rope ladders for now, probably with more to come. I've pretty much committed to the whale shape now, it's definitely growing on me. Sorry Newchurch, I agree the original was more credible. however this is steampunk, so a little flair and whimsy's acceptable right? It also solves my net problem (it was a royal pain to get looking right). I'm rendering out the latest iteration now, but at 2 and a half hours a shot, it'll probably be tomorrow before I get it posted, sorry. however this is steampunk, so a little flair and whimsy's acceptable right? Once I get the blasted propulsion system sorted, I can work on the minutiae, finalise the cloud patterns etc, and I'll be pretty much there. Oh, and any thoughts on the "balconies"? I'm not sure on the shape, but I'm having block on any better ideas. This is Looking Superb have You come up with a Name for your Ship?